Daehaeng Kun Sunim – Wake Up and Laugh! 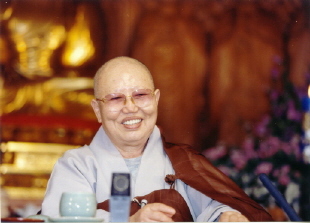 Seon Master Daehaeng was born in Seoul, in 1927, and is widely regarded as one of Korea’s foremost seon(zen) masters. She awakened at a young age and spent the decades afterwards applying what she experienced. For many years she had struggled with the question of why people suffer. Seon Master Daehaeng realized that ultimately the answer was ignorance. People were unaware of the non-dual foundation that connects all existence. Unaware of this inherent connection, people lived as if they were disconnected from everyone else. Unaware of the ever-changing nature of reality, people tried to grip and immobilize that which is ever flowing. Unaware that their foundation is endowed with all of the ability of the universe, people thought themselves weak and helpless, limited to the kindness of others or the ability of their intellect. Thus, people suffered because their behaviors and thoughts were not in harmony with the underlying truth of our world. And because people didn’t know about this inherent foundation, with its infinite ability, they also didn’t know how to free themselves from the suffering they had made. So Seon Master Daehaeng began teaching people to entrust, to let go of, everything that confronts them to their inherent foundation, and then to go forward while observing. By continuing to apply and experiment with what we understand, a small grain of faith can grow into a great ball of flame that burns up all attachments and habits of the body and mind. Once this cloud of habits and discriminations has lifted, our inherently bright foundation, our true nature, can shine through. She emphasizes that every single one of us is endowed with this bright foundation. We all have latent within us the wisdom and abilities of all Buddhas. Thus, while seon masters have traditionally taught only monks and a few nuns, Seon Master Daehaeng was determined to teach spiritual practice in such a way that anyone, regardless of their occupation, gender, or family status could practice and awaken. So in 1972 Seon Master Daehaeng established Hanmaum Seon Center as a place where everyone could come and learn about their true nature and how to live with freedom, dignity, and courage. Although she left her body in 2012, the spirit of her teachings are still there and continues on. *about Kun Sunim vs. Seon Master: both are correct, but Kun Sunim is a more frequent, natural expression. 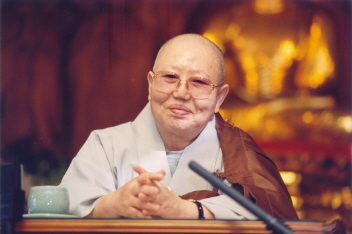 Sunim is the generic term of respect for a Buddhist nun or monk, and Kun is used to indicate great or venerable. It’s used for someone of outstanding attainment, or sometimes just out of respect for one’s age. On the other hand, Seon Master will convey more information about the person to non-Korean speakers. So it’s kind of a toss up! *Seon vs Zen: In a sense Zen has become a generic term, but having lived in Korea for many years, it’s clear that much of what’s called Zen is actually Japanese culture, and not particularly Buddhist or a reflection of this fundamental Buddhanature we all share. I use Seon because this is the term in the language that Daehaeng Kun Sunim speaks, although publishers often prefer Zen in order to give potential readers an indication of a book’s contents. Wonderful I love her teachings…simply beautiful. Al conocer las enseñanzas de la Gran Maestra Daehaeng Kun Sunim, uno se percata que se encuentra ante una autñentica Enseñanza Seon, y ante una Aunténtica Maestra. Los momentos compartidos con la Gente de Hanmaum Seon Center de Buenos Aires, me trajo nuevas fuerzas para seguir adelante, y no solo eso, sino fuerzas para compartir con otros estas enseñanzas. Learning the teachings of the great master Daehaeng Kun Sunim, one realizes that it is a teaching Seon autñentica, and an authentic teacher. Moments shared with the people of Hanmaum Seon Center of Buenos Aires, brought me new strength to move forward, and not only that, but forces to share with others these teachings. Wow! A big hello to Buenos Aires! Great to have you here on the blog! But, sadly, I can’t get your website up – I think there might be a problem in the address. Anyway, thanks so much for stopping by and leaving your wonderful bi-lingual message! Hace unos momentos te envié un mensaje con mi direccion de mail, pero no aparecio en la pagina es amshirschmann@hotmail.com mailto:amshirschmann@hotmail.com , soy de Asunción, Paraguay, y estuvimos por el Hanmaum Seon Center de Buenos Aires, Quisiera sber si se recibio el texto que te envie. I’M REALLY IN ASUNCION – PARAGUAY. WENT WITH MY WIFE TO BUENOS AIRES, A HANMAUM CONTACT WITH THE CENTER OF BUENOS AIRES SEON. MY ADDRESS IS AS FOLLOWS: (email address removed by moderator). I FIND THE BOY FROM BUDDHISM BY Proia EXPERIENCE, THEN HAVE MY MASTER LEE CHUL GRADE 9 Kuk Sool BULMOODO WAS MY MENTOR AND PASSING TO OTHER PLANS. ESUVE THERE AND LOOKING FOR KOREAN SEON BUDDHISM HAD UNTIL THE DHARMA OF CONTACT WITH THE SEON HANMAUM CENTER OF BUENOS AIRES. MY GOAL IS COMPARITR THESE LESSONS IN MY COMMUNITY. LESSONS FROM THE TEACHER IS LIKE A LIGHT, ONE NOT HIDE, BUT THE PLACE VERY HIGH FOR enlighten all sentient beings. I’m afriad I can’t get it to open! Anyway, once again, thanks for stopping by and saying hello, and all the very best to you and everyone over there where you are! ESTOY CONTENTO DE PODER COMPARTI CON UDS. Glad to see this website!!! Thank your for ur response. I will stop by whenever I have time. I’m seeking some titles of books by Dogen in Korean (or English). I’m having problems getting information due to language problems. Just how is “Dogen” written in Hangeul, anyways? By the way, I’m a beginning Buddhist currently living in Daegu, South Korea. Also, if you know of any “meditation groups” that meet regularly in Daegu, that would be useful for me too. Amazon.com is the best place for English books about Dogen. For Korean books you’d have to find a big bookstore, or perhaps try the ones around Jogye-sa in Seoul. The bookstores in large temples might also be a good bet. In Korean his name is 도원 道元, but he’s not particularly studied here. I’m afraid I don’t know of any groups there. I would try google, facebook, and the Seoul Dharma Network. If you work those links, you should be able to turn something up. MARCUS, IR SunIM CHONG, TOM AND THE OTHER BROTHERS IN THE DHARMA. ON THE SITE OF THE ORDER Jogyo I HAVE WITH THE TRANSLATOR COULD GET SOME INTERESTING PUBLICATIONS, FOR IT CLEAR THAT AGAIN must correct FOR THE PURPOSES OF THE FOREGOING, YOU KNOW IT AND ON THE PHILOSOPHY OF BUDDHISM AND TRANSMISSION OF LIGHT . I was recently in Brazil in the city of Gramado FOR A SEMINAR OF THE WORLD KIDO FEDERATION, AND HAD THE OPPORTUNITY TO VISIT THE TEMPLE OF KHARDO LING IN BRAZIL IS AN ORDER OF THE ORDER Tibetan Buddhism of the Nyingmapa or red caps, THE SITE IS REALLY VERY BEAUTIFUL, AND WAS BUILT BY A Tulku Rinpoche A.
I am very happy to RETURN TO THIS WEBSITE, SITE THAT and strangers. HANDS TOGETHER IN ALL GREETING DHARMA. MARCUS, CHONG IR SUNIM, TOM Y LOS DEMAS HERMANOS EN EL DHARMA. EN EL SITIO DE LA ORDEN JOGYE, YO HE PODIDO CON EL TRADUCTOR OBTENER ALGUNAS PUBLICACIONES INTERESANTES, CLARO QUE PARA ELLO DEBER CORREGIRLOS NUEVAMENTE PARA OBTENER EL SENTIDO DE LO EXPUESTO, Y PARA ELLO DEBES CONOCER SOBRE LA FILOSOFÍA DEL BUDDHISMO Y LA TRANSMISIÓN DE LA LAMPARA . HACE POCO ESTUVE EN BRASIL, EN LA CIUDAD DE GRAMADOS PARA UN SEMINARIO DE LA WORLD KIDO FEDERATION, Y TUVE LA OPORTUNIDAD DE VISITAR EL TEMPLO DE KHARDO LING EN BRASIL, ES UNA ORDEN DE BUDDHISMO TIBETANA DE LA ORDEN DE LOS NYINGMAPA O BONETES ROJOS, REALMENTE EL SITIO ES MUY BELLO, Y FUE CONSTRUIDO POR UN TULKU, UN RIMPOCHE. ME SIENTO MUY FELIZ DE PODER RETORNAR A ESTE SITIO WEB, SITIO QUE YA EXTRAÑABA. JUNTO LAS MANOS EN SALUDO DE DHARMA A TODOS.